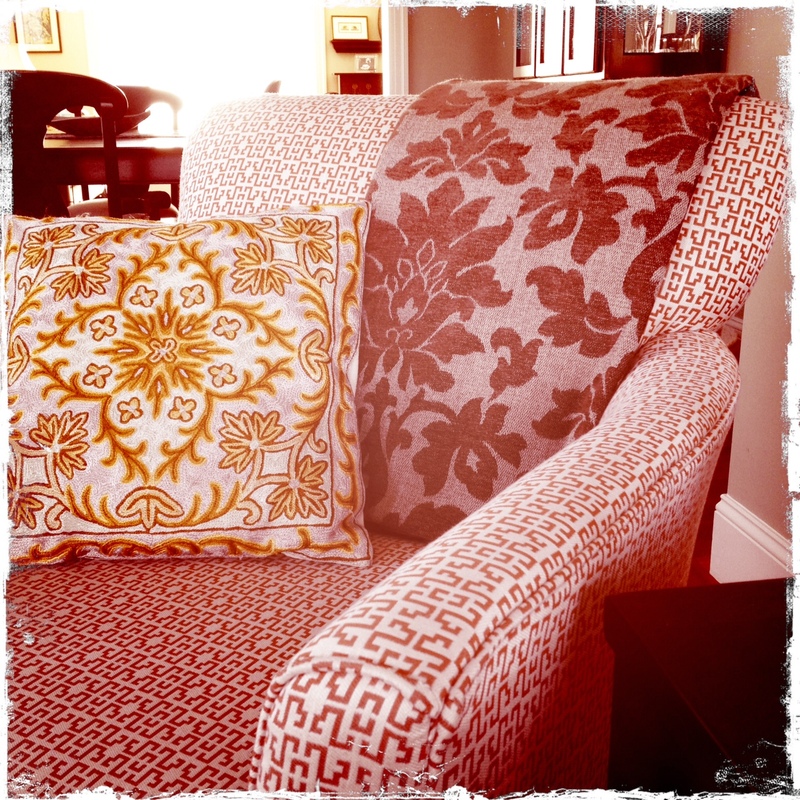 Throw pillows are one of the easiest ways to add color and style to a room. They can also be the most economical way to change the look of your living space – subtly or dramatically – without having to buy new furnishings, rearrange furniture, etc. Some folks like to change out their pillows seasonally. A pillow also conveys the level of formality or informality of a room – a long, tailored paisley bolster with tassels gives a much different impression than an oversized square canvas knife-edge pillow. I don’t want to get too much into pillow types here – but Real Simple has a great, to-the-point slide show of throw pillow styles that you might be interested in checking out. No, this post simply features some of the pillows/pillow covers that are inspiring me right now – total eye candy! I am desperate for a new sofa for our family room, but waiting on our new home where we’ll hopefully have space for a sectional (I am obsessed with sectionals for some reason!). Until then, I’m searching for some new pillows to spice up my boring cocoa-colored microfiber sofa. I haven’t found the perfect ones for my room, but maybe I’ve found something for yours? Here are some of my favorites. 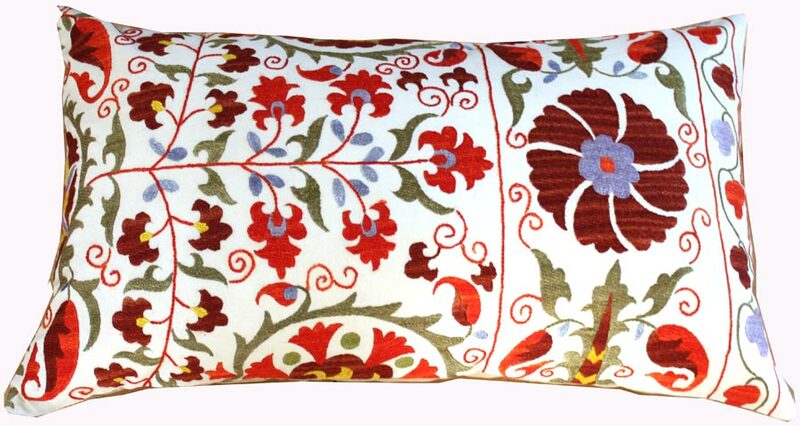 (Above) This silk-embroidered lumbar pillow is stunning, no? It’s actually from Landry & Arcari, a Boston-based purveyor of fine oriental rugs and carpeting. 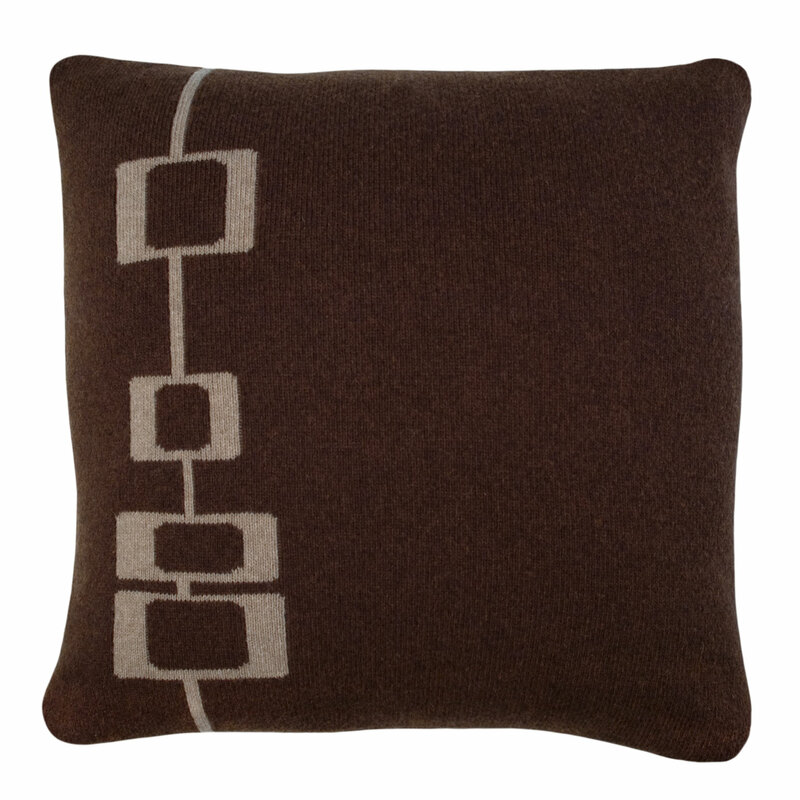 (Above) Another brilliant creation of New England’s own Angela Adams – this is the Manfred knit pillow. The soft, knit fabric really tempers the geometric design – not to mention it looks mighty soft to rest your head against. (Above) Marimekko prints are not exactly what you would call “subtle.” I happen to love them, but I can’t seem to find a way to work them into my home. 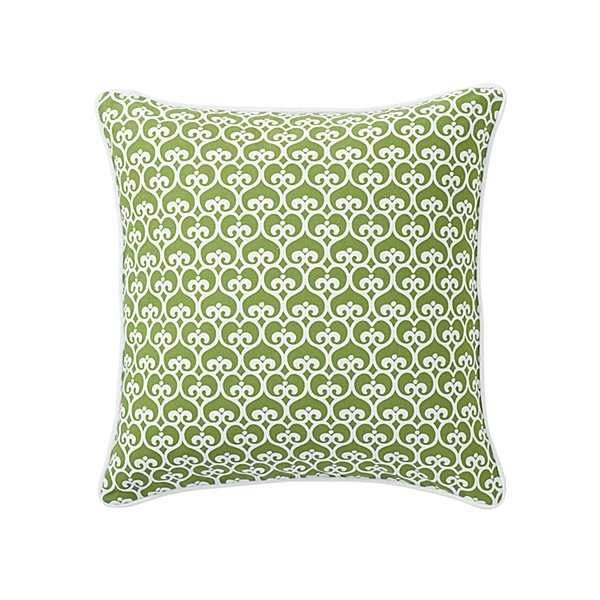 I think this pillow from Crate & Barrel, the Pieni Unikko, would look amazing on a slate blue or dark gray upholstered chair or sofa. (Above) As my friends know all too well, I have huge color crush on green. Especially grass green and, of course, my namesake hue Kelly green. Serena & Lily’s Clover Spade Pillow is right up my alley. 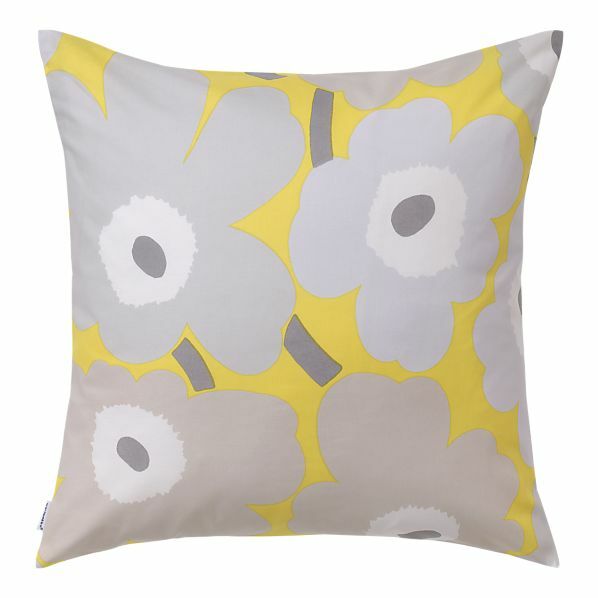 (Above) Target, the ultimate high-style low-cost destination, has SO many throw pillows online, and in stores, too. 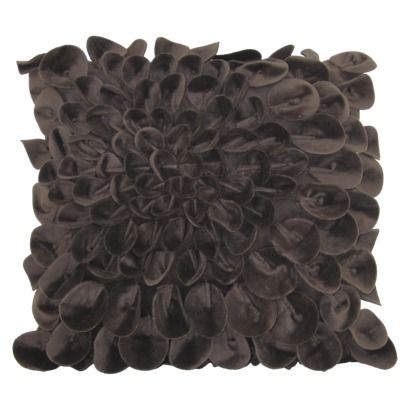 I just love this monochromatic “petal” design in dark gray microfiber, though it comes in a variety of solid colors. This would add some nice texture and tactile goodness to a tailored modern sofa. I do have one pillow in my house that I’m especially fond of. I bought it in India while vacationing with my husband and good friends back in 2006. It predates almost every furnishing and accessory in our current home, which we bought in 2007. I wish I knew more about the design motif and origin thereof – someday maybe I’ll have time to research it further. Here it is, resting comfortably on an armchair in my family room. All of this talk of pillows has made me sleepy. If you have come across any inspirational pillow designs or forms, I’d love it if you shared them here! Maybe you’ll find some that will work on my family room sofa.